PeopleTray safety software provides the four cornerstone requirements for mining project performance and safety in a single online system. It can be used to manage a team, a project, or as an organisation wide safety and compliance management system. 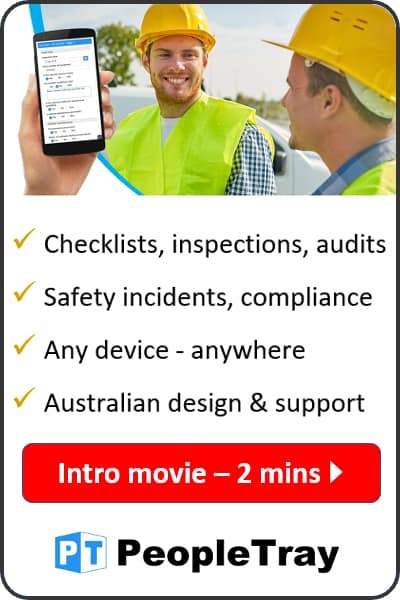 Within minutes you will have a proven safety system for managing safety, risks and compliance. Using PeopleTray simply requires registering an account. The safety software is used via a web browser and all modules are available immediately. Team members can be added and can be assigned actions and their compliances and performance managed. PeopleTray’s adoption in mining project reflects the industry drive for better management of teams that are spread across remote and hazardous locations with high staff turnover and changes of supervision and leadership. Manage safety incidents and hazards, risk assess and record investigations with the best safety software online online for sale on the market. Ensure corrective actions are assigned and completed. Maintain a risk register with controls. Manage the licences and certifications your people need to remain compliant for their roles. Record performance appraisals and communications with team members to ensure that good performance is recognised and poor performance addressed. Ensure continuity of team management when supervisors change. Upload and manage documents such as employment, contractor and project documents. Maintain team member details, including emergency contacts. Ensure a more efficient recruitment process and maintain a pool of candidates to call upon when needed. Submit activity and progress reports and alert supervisors to risks and hazards identified in the field. Request and approve requests for purchases and travel. Submit incident and hazard reports.